An attorney for the Meriden man accused of murdering a city teen over a pair of sneakers said he’ll bring a suspect to the stand next week that he believes actually fired the shot that killed 18-year-old Issacc Smith. 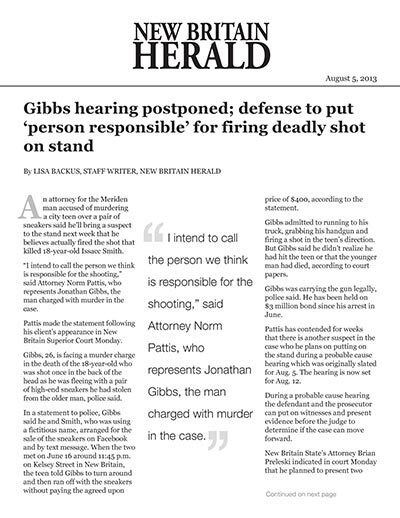 “I intend to call the person we think is responsible for the shooting,” said Attorney Norm Pattis, who represents Jonathan Gibbs, the man charged with murder in the case. Pattis made the statement following his client’s appearance in New Britain Superior Court Monday. Gibbs, 26, is facing a murder charge in the death of the 18-year-old who was shot once in the back of the head as he was fleeing with a pair of high-end sneakers he had stolen from the older man, police said. In a statement to police, Gibbs said he and Smith, who was using a fictitious name, arranged for the sale of the sneakers on Facebook and by text message. When the two met on June 16 around 11:45 p.m. on Kelsey Street in New Britain, the teen told Gibbs to turn around and then ran off with the sneakers without paying the agreed upon price of $400, according to the statement. Gibbs admitted to running to his truck, grabbing his handgun and firing a shot in the teen’s direction. But Gibbs said he didn’t realize he had hit the teen or that the younger man had died, according to court papers. Gibbs was carrying the gun legally, police said. He has been held on $3 million bond since his arrest in June. Pattis has contended for weeks that there is another suspect in the case who he plans on putting on the stand during a probable cause hearing which was originally slated for Aug. 5. The hearing is now set for Aug. 12. During a probable cause hearing the defendant and the prosecutor can put on witnesses and present evidence before the judge to determine if the case can move forward. New Britain State’s Attorney Brian Preleski indicated in court Monday that he planned to present two witnesses during the hearing. He did not identify the witnesses. New Britain police arrested Terry Gibbs, Jonathan’s uncle, in July on charges that he was in possession of more than a dozen guns although he is a convicted felon. Pattis has previously said Terry Gibbs “knows what happened” the night of the shooting. The family of Issacc Smith said through their attorney, Gary A. Friedle, that they believe New Britain police have charged the right man with the 18-year-old’s murder.